Shot this morning while on a 'photo walk' with friend Darshan. 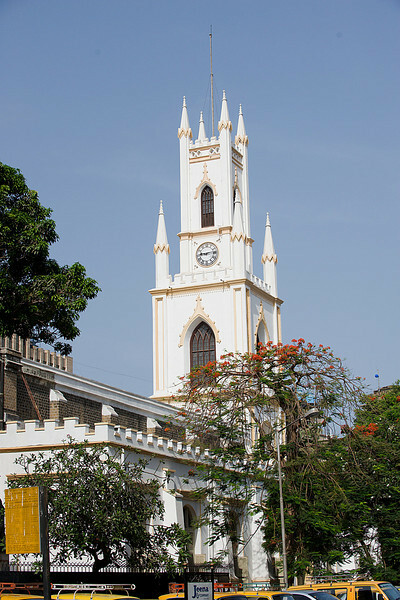 This was the first Anglican church in Mumbai (then called Bombay), built in 1718 to improve the "moral standards" of the growing British settlement. It is located close to the Flora Fountain, almost opposite my office. Here, many a Briton was laid to rest under elaborate marble tablets engraved with touching elegies – generals and clerks and young maids all lying together in the silent, sundappled interior. Most of the tombstones bear eloquent messages. The cathedral was selected for the UNESCO Asia-Pacific heritage conservation award 2004. Lovely capture -- looks like an interesting church!